Perhaps it was destiny when Roomorama offered to sponsor my first two nights in Istanbul; I could live in a local neighborhood instead of a budget hotel stuffed away on a touristy street, pick from a range of apartments listed on their website, and interact with a local host to learn about Turkish culture first hand. I jumped at the opportunity. 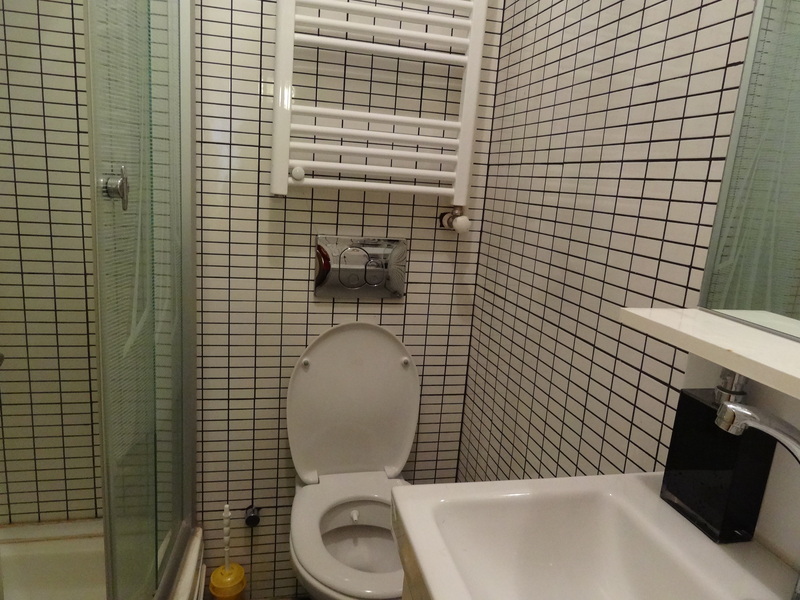 On Roomorama’s Istanbul listings, my choice ranged from a room, to a studio apartment, to an entire house, the last of course being the most expensive, and each option sounded more exciting than the next. I wrote to some of the owners via Roomorama’s platform, and luckily for me, most of my choices were available, and it felt welcoming speaking to locals before even landing in Turkey. 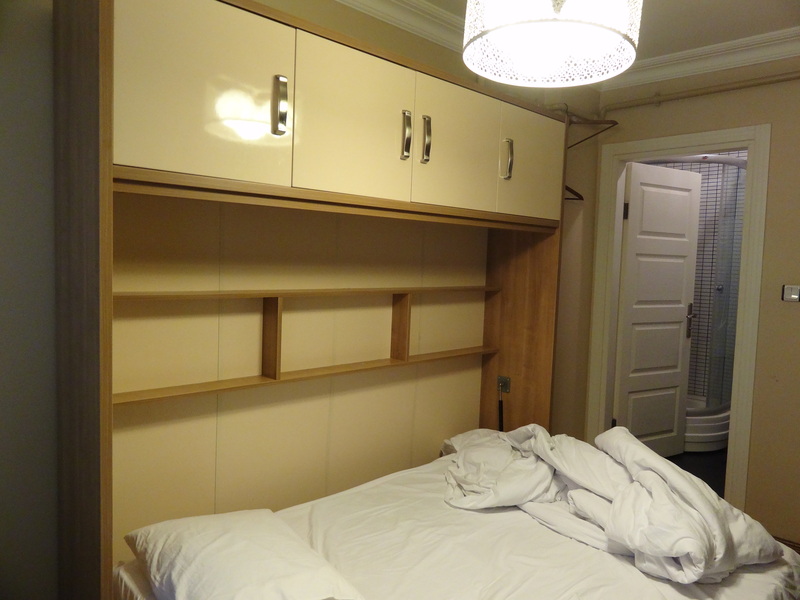 I finally chose Ezra Suites in Taksim, run by a brother-sister duo. 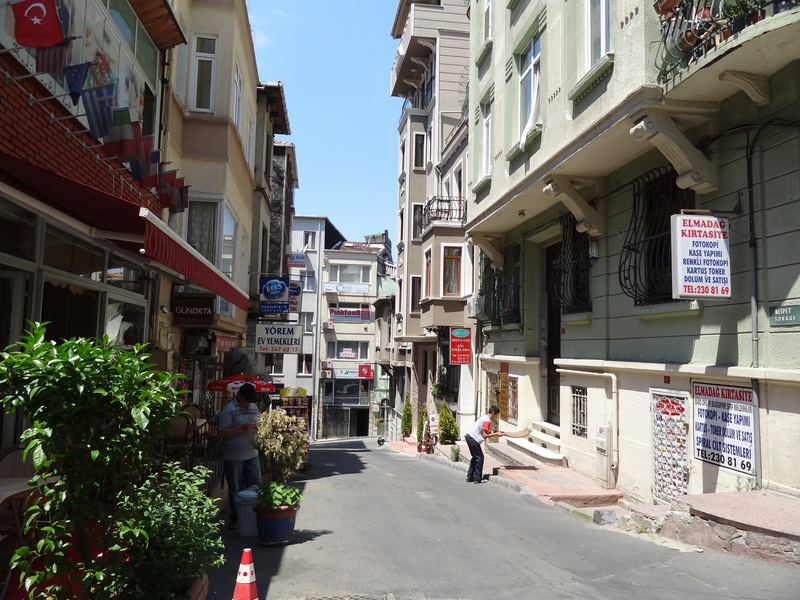 I landed in Istanbul with my backpack & high hopes, and made my way off the main street, into a small by-lane neighborhood. 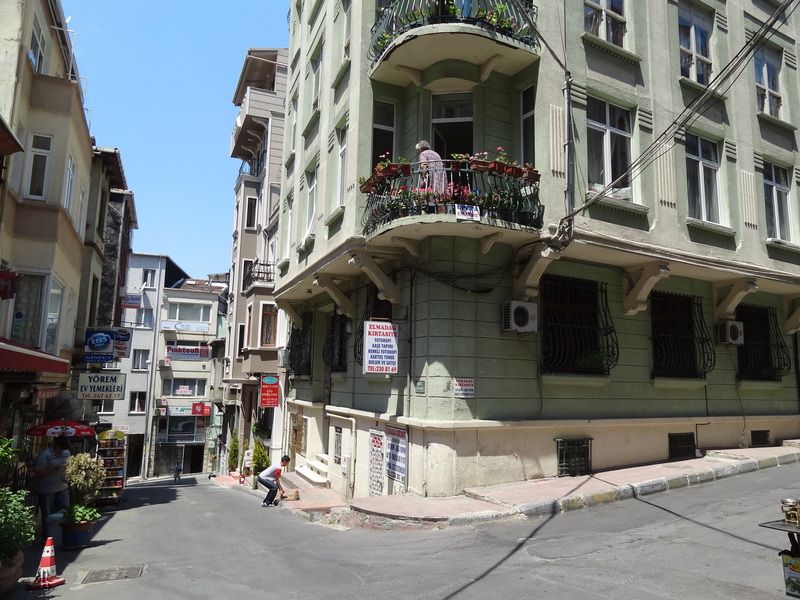 An old lady was laying out her laundry line on her balcony, small kids were playing at the far end of the street, and men were idling around at the lane’s only bufe (small street shop). It was one of those neighborhoods that you casually pass by in a big city, glance up at the buildings, and wonder what it would be like to actually live here. The building where Ezra Suites was located, with a tiny sign at the doorstep, was just one among the many old quarters of the neighborhood. I met Ezra & her brother (extremely good looking by the way, but I digress) in the basement of Ezra suites, which Ezra and her brother had converted into a mini office. They showed me to my studio, and though it was impeccably clean, my hopes came crumbling down in a second at the tininess of its size; it was so small that the bed was built in a way that it could folded into the wall to make more room! My local neighborhood in Istanbul, where my apartment was located. The bed folds into the wooden landing on the left in my cozy apartment. I decided to step out and get some fresh air, and a few minutes into my stroll, I was already in love with the upbeat vibe of Taksim, the trendy, hip new city of Istanbul, and as far as I could tell, frequented more by locals than tourists. The more I walked, the more refreshed I felt. Small cafes littered the streets. Taksim square brimmed with people just ‘hanging out’. Istiklal street glowed with the city lights and filled with men & women stylishly dressed to go shopping or eating. Men dragged along carts of simmit (sesame bagel), fried mussels, corn on the cob, and what looked like plain white rice (I later discovered that was pilav with nohut). People watched the Dondurma (Turkish ice cream) man play tricks with the ice cream cone. Everyone seemed to be having a good time, and the breezy weather was a welcome relief from the Delhi heat. Istiklal Street in Istanbul. Photo by Guillén Pérez. A vendor selling Simmit (sesame bagels), perhaps Istanbul’s most popular street food. Photo by Brian Jeffery Beggerly. After hours of culinary discoveries, window shopping, and experiencing a midsummer evening in the city, I walked back, past the hotels along the main road, into my little by lane. The bufe (small street shop) owner across my apartment greeted me with a nod, as though I had lived in this neighborhood for years, and Ezra’s brother surfaced to help me figure out the complicated lock and ask about my day. The apartment, with my bed laid out, didn’t feel all that small anymore. In fact, I was amazed at how much this little studio could accommodate without looking cramped; a comfy king-sized bed, a lounge sofa & table, a wardrobe, a small kitchenette, a washing machine, a drier, a microwave, and a bathroom with a shower stall. Surely apartment owners in Delhi could learn a trick or two from these guys! My studio with the bed folded away. I slept way past my bedtime and woke up feeling a little like I had just moved to this city and found me a cozy apartment in a friendly neighborhood, that my life was just getting started. It’s sure a good feeling on your second day in a new country, and I have Ezra & her brother and the good people at Roomorama to thank. Hotels are for ‘tourists’. Roomorama lets you do it like a local, in a neighborhood of your choice. It’s almost like having your own house in a new city for a few days. The website has enough perimeters to narrow your search and is easy to navigate. Roomorama has something for almost every budget, so whether you prefer budget hotels or travel in luxury, you’ll find plenty of deals that are better than hotels, especially if you’re travelling in a bigger group. It’s nice to make a new friend in a new city, and renting a room, apartment or house from a local is a good place to start. You could probably google & find an apartment on your own, but if you read the scams section on Istanbul’s Wikitravel, you probably wouldn’t want to do that for good reason. Roomorama is a credible resource, right from a secure (and slightly elaborate) payment system to verified short term rental listings. For internet addicts like me, most Roomorama offerings I came across offer free Wifi. Unfortunately, most Roomorama offerings (at least for Istanbul) don’t have reviews, so it does involve a bit of luck and judging a place by its description & your online interaction with the hosts. If you are used to travelling solo & staying in hostels, Roomorama may be a bit over & above your budget. 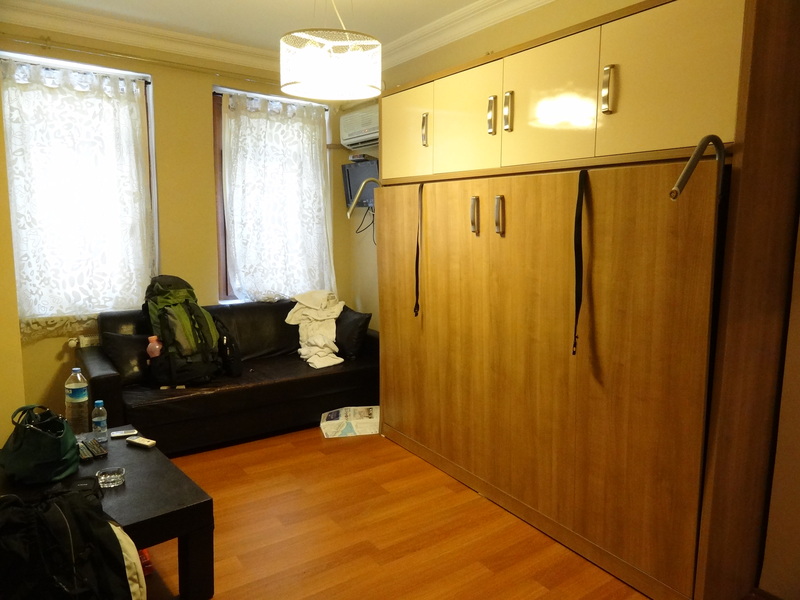 While looking for a place to stay on my last couple of days in Istanbul, I decided to put booking.com‘s apartments to the test instead and chose one without any reviews, which turned out less than perfect in more ways than one. I’d definitely go back to Roomorama the next time I visit a new city, and recommend that you try it out too. Roomorama also has short term holiday rentals on offer in Indian cities, and based on their descriptions, they sound like pretty good deals! *Note: My accommodation in Istanbul was sponsored by Roomorama, but opinions, as always, are my own. Have you experimented with Roomorama-styled accommodation? What was your experience like? Read more about my adventures in Turkey. For more travel stories, photos & tips, join The Shooting Star on Facebook & Twitter. I haven’t done this, but it looks like a great idea. 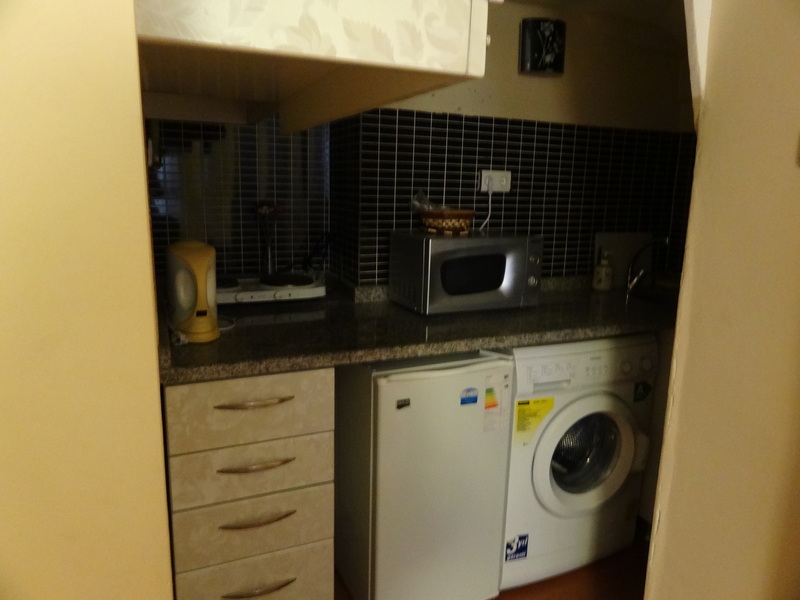 When travelling you only need a place to sleep and shower in, so a big space is often wasted. I love the way they have organized that room. Try it out sometime Debra. The studio did make me want to spend some time indoors as well, if only I had more time! The photo on your header with all the grass would be good for the colour competition,. Unfortunately that’s not mine. It’s from Flickr creative commons! Definitely worth a shot, though going back to the hostels after the upgrade might be hard! Very interesting and smart set up! Saves up lot of space! And as such when the holiday is to roam around, we are going to spend the least but peaceful time in the room. If there’s a comfy bed and nice shower…that’s more than enough! Shopping street and the crowd reminds me of India! Haha, except that no one was littering right on the road, and no bhelpuri wallas were shouting their heart out to people 😉 The set up kind of grows on you, I already miss it! I haven’t tried anything other than hotels and B&Bs. I find B&B very comfortable but sometimes there are a bit of problems when bathrooms are shared. I know it’s a little hard to step out of that comfort zone, but trust me, apartments & homestays are a different kind of addiction! The people who got this concept of saving space is a genius. Its a very small space but its very cozy. Everything you need is there in a space as small as that. Istanbul! One of my favourite cities! I could have sworn that the photo of the neighbourhood was of Selimiye, on the Asian side of the city (I stayed there with a CouchSurfing host), but obviously not as I read your post. I loved hanging out in Taksim, too – especially around the self-service canteens and fruit juice stalls! Yes, I’m a total foodie. Unfortunately I didn’t spend enough much time in Istanbul to discover the Asian side of the city; I was just so happy being in Taksim. I was quite adventurous with my (vegetarian) food this time too 😉 Have you tried Falafel House in one of the bylanes of Taksim? I didn’t know about roomorama. From your photos I can say it looks better than a typical hotel room. I’ve visited Istanbul several times and I slept in hotels. Next time I go there, I’ll try alternative options like the one you are talking about. I can vouch that it is, and there are so many options to choose from. Let me know how it goes if you try it next time! I forgot to ask you something: what is your opinion on house exchanges? Would you do that? There are people who worry to let unknown persons into their homes. If I had a house, I’d surely do that. But as of now, doesn’t look like I’ll afford to own one anytime soon (or not so soon). A little background check doesn’t help, and the internet is a great source – just like couchsurfing helps to sift out the good from the bad through reviews of the community. Have you tried it? In Dublin city there are so many ancient night clubs, only this much was my knowledge about the city before reading your article. Now I have some more knowledge about the city. Thanks for sharing your experiences. Next PostHow I Afford My Travels, and How You Can Too.